By Caroline Green, published by Piccadilly Press. Goodreads synopsis: Tara has the power to find missing things and people, but it’s only been a source of trouble for her so far and she’s relieved when her family move house so she can make a fresh start and try to forget about the odd images in her head. Making friends at her new school hasn’t been easy, especially with mean girls like Melodie Stone running the show. Then Melodie disappears. Tara’s not too sorry, but she starts to see strange images of a captive girl who she gradually realises must be Melodie. Tara tries but fails to ignore the pictures in her head and finally goes in search of Melodie, with the help of Melodie’s attractive half-brother. She finds herself trapped with her former enemy, and Tara and Melodie must work together to get free, with the help of Tara’s gift. My review: Hold Your Breath was such a brilliant thriller! From the blurb on the back, it seemed a little too confusing, but as soon as I began the story, I couldn’t stop. The writing was brilliant, and the author clearly has a knack for keeping the reader on the edge of their seat. As the story began, I was instantly immersed in the world of Tara, and hints were frequently dropped that something terrible had happened to her in the past involving a child. The hints were cleverly dispersed, and left me itching to read on so that I could find out the full story. In fact, it was a little like By Any Other Name by Laura Jarratt- because that’s a story where the girl slowly reveals her shocking past, too. So, as that dark past slowly unravelled, so did a tense, eerie story line involving a suspected kidnapping. I loved the build up to the outcome of both events- and how both past and present wound together, to help Tara rescue Melodie Stone. There was also, soon after Melodie disappeared, a kind of vague love triangle involving Tara, Melodie’s half brother, and Melodie’s boyfriend. Though love triangles are getting a little too common in YA fiction, I was so excited to see the outcome for this one. As Tara played detective, she started getting closer to both characters. However, and I won’t reveal which love interest, is part of a shocking event that basically kicks him out of the whole story, I got a little disappointed. Although that definitely shook things up, Tara didn’t seem to feel much sympathy. Instead of going to visit this person in the hospital, she went down to the Lido for more answers, and made it seem like she was going to go and see him later. But she never did. Apart from the slight mention of this love interest at the ending to Melodie, there was no other mention of him after the said shocking event. Where was Tara’s sadness, her anger, her sympathy? Where was everyone else’s? It just seemed like he was forgotten about- when he was quite a central character before. This, I think, was the only fault in the story for me. Tara was a really great protagonist, straight from the start. I doubt any other teenage girl would go out looking for the girl that she originally hated and was picked on by. That’s what I admired in her, and it made her a good role model, in terms of forgiving. I loved her investigative side. She seemed a bit like the teenage, female, modern Sherlock Holmes, hunting for clues to solve a crime. I really enjoyed reading her action-packed, dramatic adventure. Her background was really well illustrated, both through the flashbacks to the past, and through her family. It was explained all really well. Tara’s supernatural gift was really cool- who wouldn’t want to find whatever they’ve lost? Though, obviously, I got kind of put off from wanting to be able to do that when Tara’s ‘fault’ affected a life massively in her past. Overall, Hold Your Breath was a brilliant read, from an author that’s new to me and that I’d love to read more from. I’ve heard lots of praise about her previous novels, and I hope they’ll be as brilliant as this read! 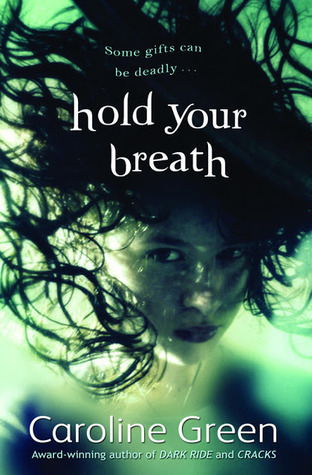 Fast paced, thrilling and with a supernatural twist, I’m sure that Hold Your Breath will be thoroughly enjoyed by teenagers. It has elements of crime and ransom in it, as well as reflections on teenage life and love. It was very well written, and the author clearly has a real talent for storytelling. Keep on writing, Caroline Green! I received a copy of Hold Your Breath from the publisher, in exchange for a review. In no way at all did this affect my thoughts. This entry was posted in Uncategorized and tagged crime, drama, love, thriller on June 28, 2013 by keithbwalters.